South Africa are set to play host to England in a three-Test series in 2012 at the start of a new global 10-year playing schedule introduced by the International Rugby Board. The England series will be the first lengthy tour of South Africa by a single nation since a similar three-Test series against New Zealand in 1996 and represents a return to traditional tours of the past. The Springboks will also host three-Test series against France and Ireland in proceeding years with the announcements coming after the ratification of the IRB's eagerly-anticipated change to the fixture schedule for the period 2012 to 2019 earlier this week. 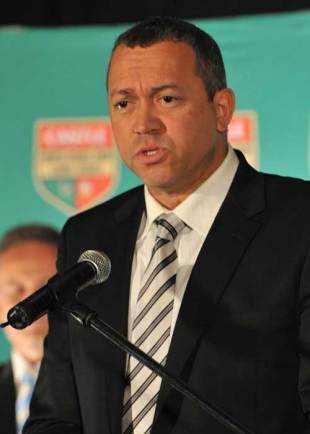 "I think everyone in rugby has been yearning for a return to old style tours and the IRB has now been able to deliver," South African Rugby Union (SARU) president Oregan Hoskins said. Only the British & Irish Lions have toured South Africa for longer than a two-Tests series in the past 14 years - in 1997 and 2009 - and Hoskins hopes the new format will help build the type of anticipation that followed the Lions' visit last year. "We experience the drama that a proper tour delivers every time the British & Irish Lions appear and both the tourists and the host nations in the southern hemisphere were keen to see this change," he added. The other three-Test series for the world champions will take place in 2016 against Ireland, and a year later against France. England will then return for another three-Test series in 2018. In the 2013 season the Springboks will host Italy, Scotland and another tier-two nation, while 2014 will see Wales visit for a two-Test trip along with the Scots coming back for another match. Inbound Tests are not scheduled for the World Cup years of 2015 and 2019. There has been no change to the format of South Africa's year-end tours to Europe with the combination of games against Six Nations teams - playing each country three times in the six years of the IRB Tours Schedule - set to continue.